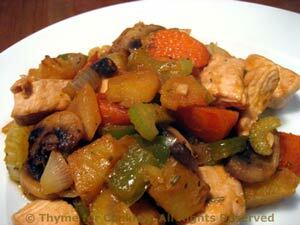 Turkey and Vegetable Hash, Thyme for Cooking One Dish Dinners, quick and easy. I buy turkey tenderloins for use in dishes like this. If they are too large for a single meal I cut them in half (or whatever) and freeze the rest. The tenderloin is very lean, takes on other flavorings easily and can be cut to size. Roll-cut carrots: cut the end off the carrot at an angle, roll carrot 1/4 turn and cut next piece about 3/4 inch away at an angle, roll 1/4 and cut next piece, etc. Steam potatoes and carrots for 15 minutes over medium-high heat, until they are just tender. Chop onion, pepper, celery and mince garlic. Clean mushrooms and slice thickly. Heat 2 tsp oil in large nonstick skillet over medium - high heat. Add onion, pepper, celery and mushrooms. Sauté until tender, about 7 minutes. Add garlic and sauté 3 minutes longer. Remove onion, etc to a plate. Add turkey to skillet and sauté 3 - 5 minutes until browned. Heat remaining 2 tsp oil in skillet and add carrots and potatoes. Stir-fry until vegetables are lightly browned. Return everything to pan and heat through. Add soy sauce, mustard, oregano, stock, ketchup and heat through, stirring constantly, 2 - 3 minutes over medium heat. Serve.